Hi folks, I am really struggling to trace my family tree. 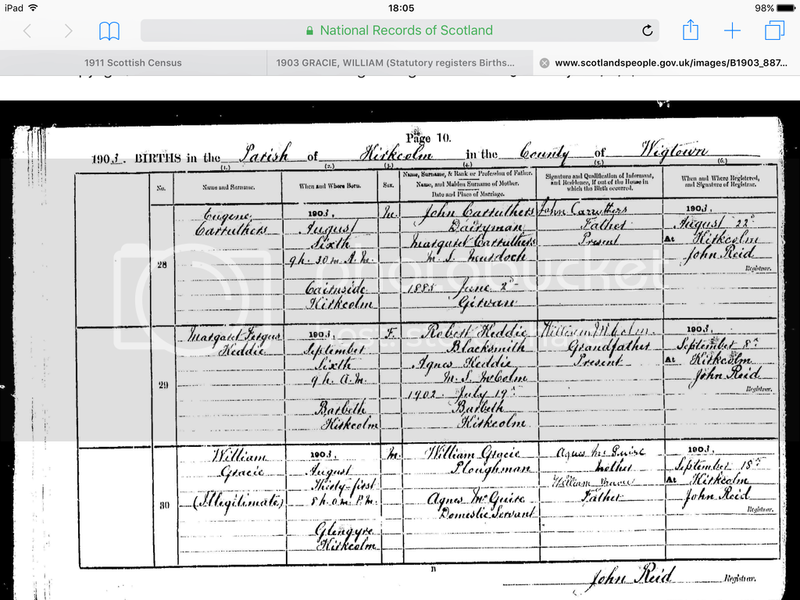 I have gotten as far as my great Granda Gracie (William) but can't find his fathers name. On the photo below is the birth of William. I need his mother and fathers name but they don't seem to be on this entry or they are also called William and Agnes which is doubtful. Im so confused as this is new to me. Do you see Williams mother and father on here? William (just born here) is to marry Agnes McGuire and have children, my Granda being one of them. William Gracie .. born 1903 illegitimate.. father also William, mother Agnes McGuire. I agree with swede, I would say the William born here is a brother of your grandad. It is strange for it to say illegitimate when the fathers name is present!? Apologies mid read the surnames of parents... illegitimate child as parents not married Sure also says illigitimate when only mothers name recorded. Was your grandfather called William ? Look to see if there is a death certificate for baby William. He may have died in infancy as this was all too common at this period !! Also check the 1911 census as this will tell you if he survived until then. If father William went with Agnes to register the birth his name will appear on the certificate although they were not married at the time. You will also find that in small rural communities there were common family surnames (siblings and cousins) while the Christian names were repeated down the generations of these families!! It can be a minefield. Also the census for before and after 1903. That will help confirm who is who, and also any siblings. They were definately not married at the time of the birth, as the mother signed with her maiden name. It was not unusual for couples to 'live in sin' at this time, due to finances. Illegitimate children were also rife in the fishing villages, I know, I've had to track down a few unexpected bar stewards when researching friends family trees. Closer to home, my Nana was born 6 months before her parents married (1899), apparently due to lack of funds for a wedding. We never knew her date of birth until after she died, when we got hold of her birth certificate. Nana was obviously embarrassed by that 6 months gap. There's not a family in the land that doesn't have children of unwed parents. Further - if there WAS I venture to suggest that NONE of us would be here today! Very true! Ive been finding out just how bad it was for some folk to be born out of wedlock, theres a rather sad story in the family as ive found out. This area was pretty much fishing villages and harbours. I don't know if being illegitimate, or unmarried in some of those fishing villages was as 'sinful ' as we imagine it would be. Or at least more accepted than non-fishing towns and villages. These villages, were fairly insular, and while the men were out at sea, the women would be as involved with the 'industry', with tasks of repairing nets, etc, so they were no pushovers. The loss of life at sea was also very high, and this uncertainty does seem to be reflected in more relaxed attitudes, at least up to the end of the 1800's. I certainly came across a lot more recorded cases of fathers with multiple partners (and offspring), in the Fife fishing villages I researched. I read a few sad cases, with attached legal recordings of women going to the court to declare the drowned man as father to their child. In some cases it was, like I said I have a rather sad story about it in my family. The stigma of being born out of wedlock and the child being given away to relatives in wedlock. It most definitely mattered to some folks.